Head: Up To 150 Mtrs. EVEREST Vertical Sump Pumps Are Specially Designed For Long Life, Trouble Free Performance. The Special Design Of Intermediate Journal Bearings & High Machining Accuracy Maintained By Us Gives Added Life To The Pumps. 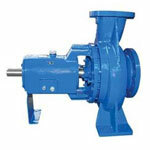 The Pumps Are Used As Dry Pit & Wet Pit And Driven By Vertical Flange Mounted Motor. The Pumps Are Available Up To 7500 Mm Shaft Length And Up To 1500 M3/Hr Capacity & Are Suitable For Coal Washeries, Mines, Cement Plants, Irrigation, Sea Water, Effluents, Etc. Food - Sugar Refining, Bleaching, Disinfecting, Waster Water/Chemicals - Purifying Water, Deodorizing Sewage, Industrial Effluents, Steel - Steel And Stainless Steel Picking, Acid Recovery, Acid Transfer, Oil & Gas - Well Acidising, Petroleum Purification, Chemical - Catalyst Transfer, Acid Transfer And Neutralizing.